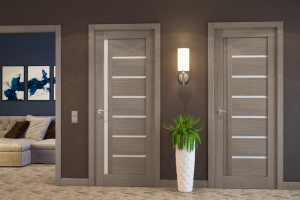 Our Modern interior doors are made of defect-free finger joint lumber with a thin MDF layer that strengthens the protection of the wood. Finished with a German polypropylene film (PP) known as eco-veneer Renolit. Eco-veneer is an environmentally friendly product that does not contain any toxins or formaldehyde and is also resistant to micro scratches. See this door in our showroom. Get Hours and Directions.